A fabulously rich region with beautiful waterfalls, landscape and unique features like the Giant’s Causeway in Co Antrim are all easily accessible from the capital Belfast – itself an intriguing city with a fascinating history that has enjoyed a renaissance of late. The recent regeneration has turned it into a leading tourist destination with its unique political murals of the Irish conflict and the Titanic Quarter – stunning redeveloped dockyards where the iconic ship was built. Other top activities in the country include a traditional Irish pub crawl, a walk around the city walls of Derry and a look at the parliament building of Stormont. There are also beautiful beaches of Ballycastle and Castlerock and stunning country mansions-turned-hotels that are ideal for exploring the surrounding countryside. Known for its soda bread and other traditional Irish dishes like colcannon, it’s best known for whiskey and distillery tours are a big draw, especially the original iconic Bushmills site, while restaurants throughout the country have now evolved to showcase the region’s rich and diverse food landscape and offer a wealthy of private dining options. 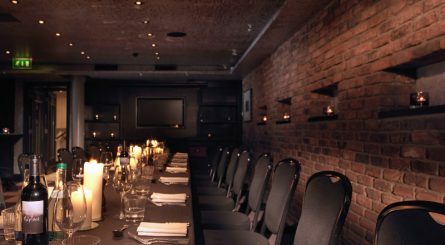 Malmaison, Belfast has two private dining rooms; one able to accommodate 40 diners and the other seating up to 10 guests.